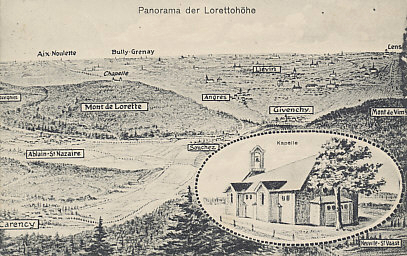 A panorama of Loretto Heights including part of Vimy Ridge. Notre Dame de Lorette, a pilgrimage site in 1914, stood on the Heights, and was, with Vimy Ridge, part of the high ground seized by German troops in the Race to the Sea after the Battle of the Marne. French commander Joffre hoped to capture Loretto Heights and Carency, a village the Germans had fortified, in the First Battle of Artois in December, 1914. 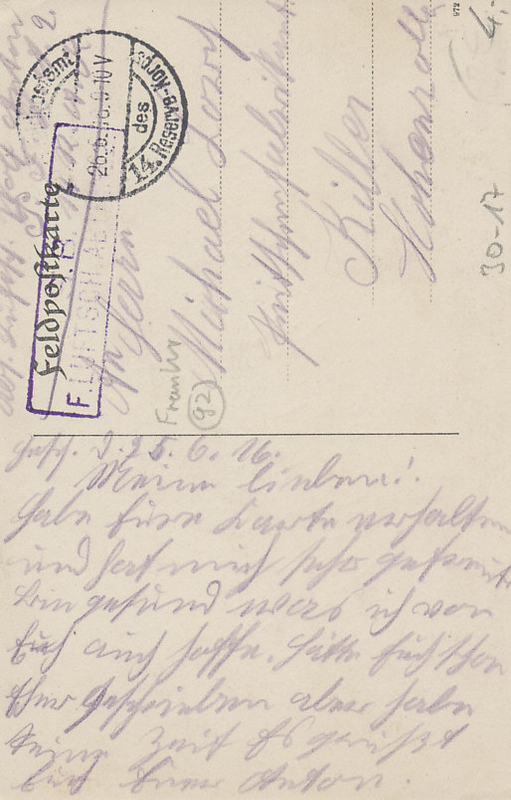 Message dated June 25, 1916, and field postmarked the next day by the Fourteenth Reserve Corps. The French attempted to wrest the high ground of Vimy Ridge and Loretto Heights from the well-entrenched German defenders in the Second Battle of Artois. Generals Joffre, Foch and Pétain led the battle, which began with 1,125 French guns firing over six days, the greatest preliminary bombardment of the war to date. The infantry attacked along a 19-kilometer front at 10:00 AM on May 9, 1915, and were initially successful, particularly at the center which advanced 4 kilometers at Vimy Ridge, taking the village of Souchez despite troops being shelled by their own artillery. In the battle, the Moroccan Division broke the German front for the first time. Despite his troops success, Pétain had no reserves to continue his advance. When the Germans counter-attacked at 3:00 PM, French reserves were too far behind the line to join the battle, and the French retreated. Coordinating with the French, British and Indian forces attacked on May 9 at Aubers Ridge in French Flanders. They did not have enough shells to continue the offensive for a second day. 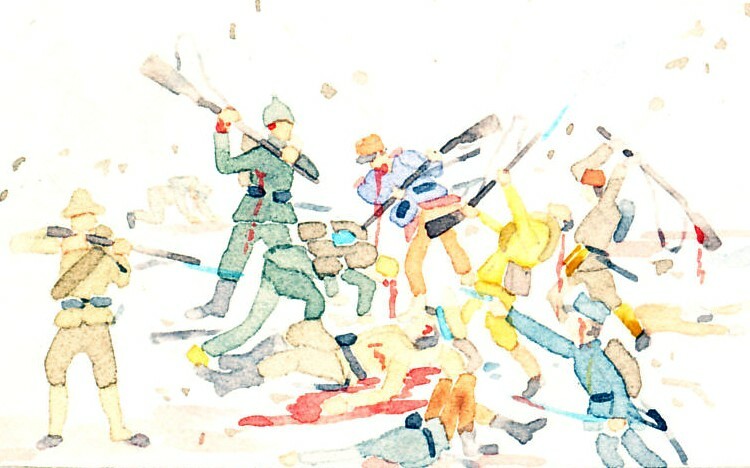 The French continued the battle for six weeks, capturing some lost territory: the ruins of the shrine at Notre Dame de Lorette on May 12, Carency on May 14, Ablain-Saint-Nazaire on May 27, and the "Labyrinth" on June 9. They halted the battle on June 25, 1915. The French suffered 102,490 casualties: 16,803 dead, 22,068 missing, and 63,619 wounded. The British lost over 10,000 men (lost 11,161 men and 458 officers) in their supporting action. The Germans suffered 75,000 casualties. On May 14, five days after the aborted British action at Aubers Ridge, the Times of London published the first story on the shell shortage.